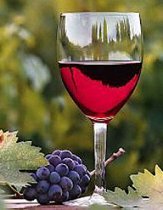 Lately, more and more specialists are talking about health benefits and medicinal value of red wine, which is actually an alcoholic product and should be considered harmful to our health. Just two weeks ago this product was added to the list of recommended foods for healthy nutrition in 2010. Red wine benefits are now vividly being discussed in mass media, but what should we know and remember about this product and its effects on our health? Red wine benefits include its property to improve our cardio-vascular health. Red grapes contain extreme amounts of flavonoids which aid in strengthening our heart, lowering the chances of clot formation, lowering the levels of bad and increasing the levels of good cholesterol. Also, red grapes are a great source of reservatrol, which lowers the risks of cancer as well as slows down considerably the process of nerve cells destruction and assists in fighting against such diseases as Alzheimer’s and Parkinson’s diseases. The studies in Canada also showed that antioxidants in red grapes are useful for good dental health. However, along with these amazing health benefits of red wine, there are also serious risks connected with regular consumption of this product. Medicinal value of red wine is scientifically proven, but, at the same time, drinking alcoholic drinks is linked to problems with liver, pancreas and nervous system, along with increased risks of having breast cancer. Scientists warn us that drinking more than 250 ml of red wine a day is associated with developing such problems as high blood pressure, depression and suicidal thoughts, liver malfunction, various inflammations, infertility and fetal abnormalities, etc. That is why recently the world’s leading specialists express their concern about red wine consumption by those people, who want to use therapeutic effects and red wine benefits. It is extremely important to follow the recommendations and drink no more than the suggested dose of red wine. This dose is: 120 ml a day for women and no more than 220-230 ml for men. Never think that the more drink you consume, the more chances you get to enjoy red wine benefits. In reality, it does not work this way and drinking more red wine can only harm you. I guess that those who do not drink alcoholic drinks would better not start doing this and look for other natural sources of antioxidants and flavonoids. There are scores of them! Drink tea and eat lots of fruit and vegetables. Red wine is also reported to increase the levels of good cholesterol in blood, isn’t it? But you can achieve the same effects if you make a habit of maintaining an active life-style and going in for sport every single day. Instead of drinking wine, talk to your therapist or a health care specialist, learn more about negative effects that alcoholic drinks may have on your body, create and follow your individual weight management program, practice healthy nutrition, be active and remain healthy for many many years!